Potoroo Palace is a not for profit organisation whose aim is to improve the habitats and wellbeing of the native animals already in our care and to promote public awareness of their plight in the wild and to educate the community about the importance of the conservation of our unique Australian native animals and plants. Take time out to relax and enjoy the picturesque surroundings at your own pace. A perfect place for a picnic or BBQ, or enjoy either lunch or maybe a Devonshire Tea served in the beautiful sandstone building or in the colourful gardens. Coaches and group bookings always welcome. Plenty of activities for adults and children alike, a train ride around the Park, and a chance to get up close to native wildlife and feed them to. We have native reptiles, birds and animals for you to enjoy - 47 species, some of which are endangered. 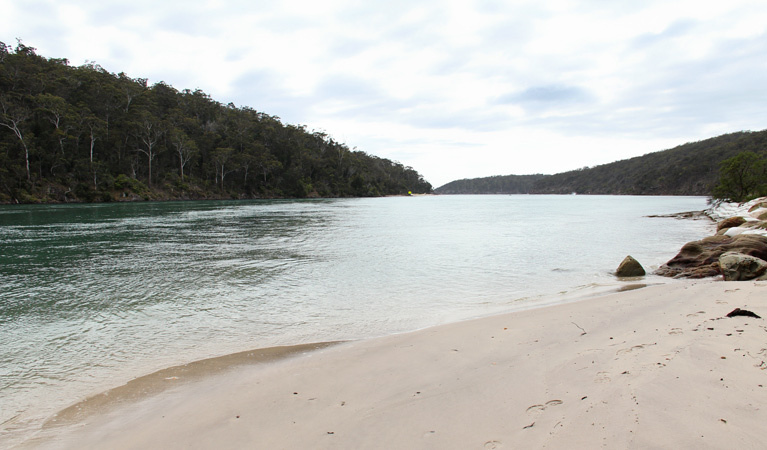 On the foreshore of Pambula Lake with views of oyster farms across the water. Broadwater Oysters is a working oyster shed where visitors can talk to the farmers about the local oyster industry. Oysters are processed for the public and restaurants on site, so visitors can watch as they shuck the oysters ready for sale. Enjoy freshly shucked Sydney Rock Oysters on the edge of Pambula Lake or take them home, shucked or unshucked, to have at your leisure. Oysters from Pambula Lake are highly acclaimed - treat yourself to some of the best. 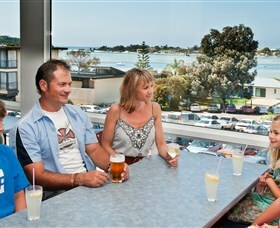 The Merimbula Returned Services Leagues (RSL) Club, is the leading club in Merimbula. 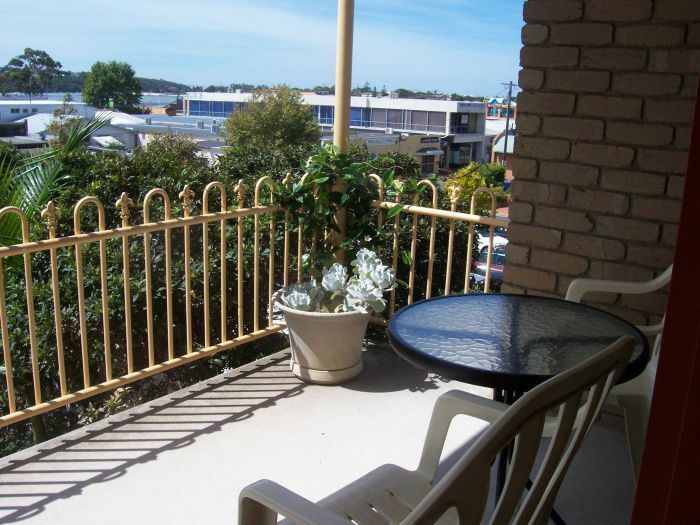 Their members and guests can enjoy a relaxed atmosphere, great food and magnificent views of Merimbula and the waterways. Their services include free entertainment, bingo and raffles three days a week. All this plus the best food in town at the Coral Sea restaurant. They also have free wireless internet, two snooker tables, bottle shop, TAB, free child minding, and corporate function facilities. Come along and see what makes them a favourite destination for members and guests. Wheelers Oyster Farm Tours and Restaurant offers the opportunity to discover the complete oyster story with a tour of their state-of-the-art factory and their own video showing the complete history of oyster farming and the life cycle of oysters. Plus, of course, a delicious taste of the oysters, straight from the lake. Overlooking the sparkling waters of the Pacific Ocean, Tura Beach's 18 hole championship golf course is a mainstay in the Top 100 public courses in Australia for its brilliant design and unparalleled scenery, and was Australia's first dedicated golf course community. Designed by Peter Thomson and Michael Wolveridge, Tura Beach Country Club is a true golf gem of the far south coast of New South Wales. The Club also boasts two of the best grass bowling greens in the region. The greens, the "million dollar views", and friendly people, make playing at Tura a very pleasant experience. So while staying in the area don't miss out on playing this unique and challenging course. Its reputation is growing every day, and with the clubhouse that is renowned for its "million dollar views" and Seaview Bistro open seven days, it's one of the most popular tourist destinations on the coast. 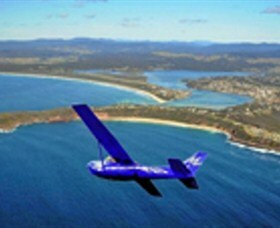 Based at Merimbula Airport, halfway between Sydney and Melbourne on the beautiful Sapphire Coast of NSW, Merimbula Air Services provide aircraft charter, scenic flights, flights to Gabo Island and aerial work in the south east region. They are also an agent for helicopter flights and sky diving in season. Flight training is available with our fully qualified instructor, with pilot accommodation available within walking distance of the airport. Merimbula Air Services can even arrange your own outback tour to destinations such as Broken Hill, White Cliffs, Birdsville and more. Rotary Walk starts from Rotary Park (adjacent to Spencer Park). This walk guides you through the twists and turns of lush vegetation, down steps and along bridges until you arrive at Bar Beach. The walk is quite is secluded and hard to see from the road as it has been cut out of rock and takes you along the edge of the ocean. 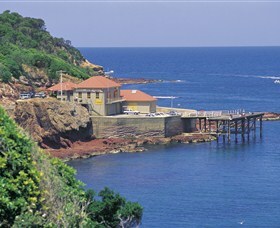 Merimbula Divers Lodge offers scuba diving and snorkelling courses on the Sapphire Coast. 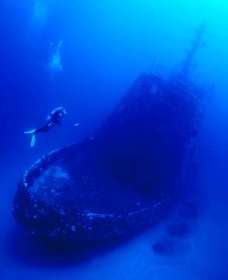 Learn to scuba dive independently, enjoy a one day dive experience or a snorkelling adventure. 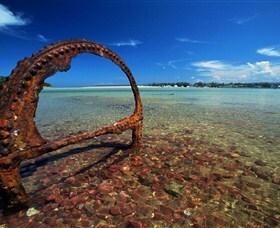 Dive from shore or from boats over natural environments and the famous wrecks Empire Gladstone, Tasman Hauler and the Henry Bolte. Also available is gear hire, sales and budget accommodation. Merimbula's Magic Mountain is a great way to spend a day. You'll find a range of activities including grand-prix racing cars, toboggan, water slides, roller coaster, carpet slide, jumping castle, mini golf and more. 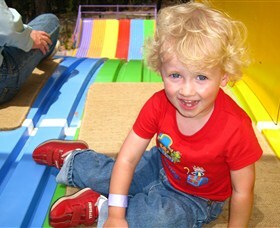 Magic Mountain offers birthday, Christmas and corporate parties, and holds fantastic events throughout the year. 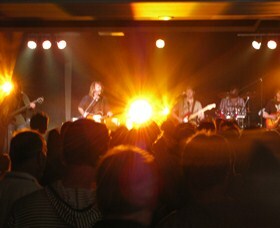 The park boasts a fantastic performance stage for concerts, set amongst the tranquil bushlands of the far South Coast. Picnic and barbecue facilities are available for use and snacks are available from the Kiosk and Tram Takeaway Food Bar. Magic Mountain now offers the Tree Climb Challenge, a high ropes adventure course for all of the bigger kids, it is individually priced at AUD30 a participant. Age and Height restrictions apply so please see the website for more details. Entry into the park is free all year round. Ben Boyd National Park is named after Benjamin Boyd, a prominent 19th-century entrepreneur. Its rugged coastline of folded red rocks contrasts with the sapphire blue Pacific Ocean. It is a special place for the local Yuin Aboriginal people. Pristine surf beaches, rugged bays, quiet campgrounds, sheltered inlets and a historic lighthouse are key elements of this stunning landscape. Its heathlands and forests are home to many plants and animals including threatened species like the ground parrot, hooded plover and long-nosed potoroo. The park is found north and south of Eden in two parts. 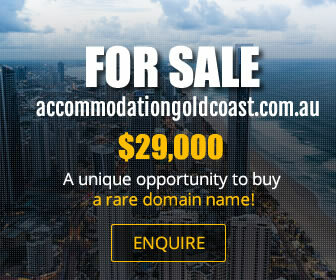 Major attractions are Green Cape Lightstation, the spectacular Light to Light Walk and camping at Saltwater Creek and Bittangabee Bay in the south. Pinnacles and breathtaking views from Haycock Point are highlights in the north. Swim, fish or picnic next to vast stretches of ocean beach. 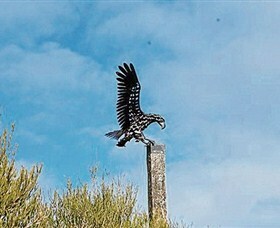 Watch out for kangaroos, sea eagles, migrating whales and forest birds. The most vibrant lounge/auditorium on the South Coast is thrilling local audiences night after night with Club Sapphire Merimbula now being recognised as the entertainment centre catering for all. The spacious Pacific Bistro presents international cuisine and family menus across the board providing the best value dining in town. The intimate atmosphere of the Rockpool Cafe caters for the most discerning tastes with a delicious a-la-carte and cafe style menu. 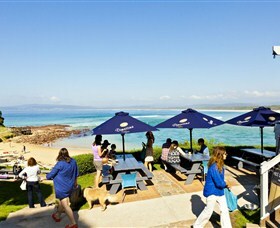 The alfresco Rockpool Cafe Beer Garden has a unique style of its own, a perfect setting for relaxed indoor/outdoor dining or for a coffee or refreshing drink. Merimbula Health and Fitness is a complete fitness centre with great gym facilities. The complimentary courtesy bus and childminding facilities add to your experience where you will have your holiday of a lifetime. 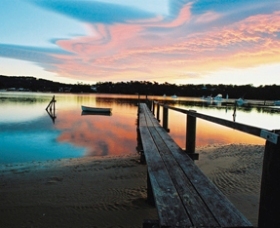 The Merimbula Boardwalk is approximately 3.4 kilometres and takes about 1-2 hours to complete. The boardwalk is great for pushchairs and bikes. There are signs along the way to highlighting the local marine life and vegetation. 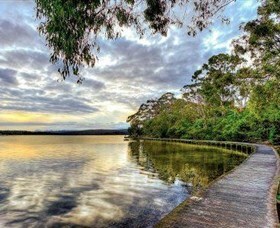 It is an easy walk for everyone and gives stunning views over the lake and surrounds. The Old School Museum building was originally constructed for use as a school. The land was donated by Sir William Manning and the school opened in 1873. 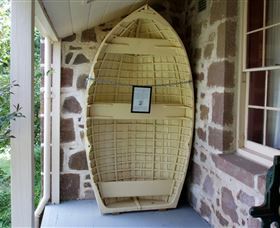 It is believed to be one of only three schools built which comprised both classrooms and a teacher's residence remaining in New South Wales. In 1875, enrolment totalled 39 children. The building was vacated in 1946 and stood unused for many years. In 1973 the Merimbula-Imlay Historical Society began operating the museum from this very suitable building. The structure is listed on the register of the National Trust of Australia. Panboola Wetlands is a conservation, restoration, educational and passive recreational and tourism project, embracing the history and diversity of the wetlands within the flood plain. At Panboola, you will find fresh water billabongs, plantings of thousands of trees, shrubs and ground covers. There are also walking tracks with information panels with historic points and birdwatching areas. The sandbank known as Merimbula Bar at the north end of Merimbula Main Beach is one of the South Coast's true postcard waves. A lovely left-hander that enjoys almost total protection from the northeast sea breeze thanks to a bulky northern headland, "the bar" is at its best on a south swell. The beach going south towards Pambula does see the odd wave breaking onto the variable sandbanks, but really this is just sunning and strolling territory. The only 27 hole golf course on the Sapphire Coast of New South Wales, the course winds its way through beautiful native bushland abutting the pristine Merimbula lakes. Lots of Australian wildlife on display. There is social and competition golf, and hire facilities including clubs, buggies, and motorised carts. After golf, enjoy a meal or a drink in the friendly, relaxing and modern clubhouse which overlooks the course and Merimbula in the background. Watch the kangaroos leisurely grazing. The high quality Glasshouse Restaurant and the Cafe are open seven days and nights. The courtesy bus will pick you up and take you home. 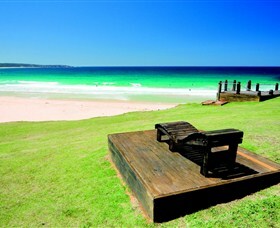 Relax at the Pambula Merimbula Golf Club and experience one of the real features of Merimbula. Spencer Park Beach is shallow, clear and waveless, which makes it popular for families with small children. When the tide is out, the beach stretches out as far as Bar Beach where you can make your way across the shallow water to other side. The park has a playground and amenities. Short Point Beach has some of the best coastal views on the whole Sapphire Coast, popular for divers, windsurfers or just relaxing overlooking the beach. Sun Deck chairs cater for a lay back coastal feel. A short walk down the cliff from the car park gives quick access to the beach. It offers a great land based whale-watching location to view passing whales in season (October-November). Merimbula Bar Beach is sheltered from the wind, which makes it a popular spot for families, as the beach is peaceful and calm. 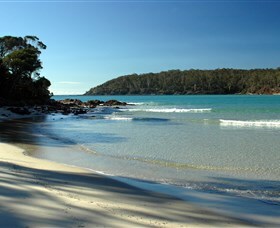 The beach is also popular for snorkelling during the summer months. When the tide is out, you can swim across to Main beach or walk across to Spencer Park. From sharks to shrimps, the octopus to the tropical fish. It's all on display in our living theatre of the deep. Fabulous 27 fish tank aquarium and a fantastic ocean tank. Feeding time always produces lots of action. 11.30am Monday, Wednesday and Friday (Monday - Friday during School Holidays). The Aquarium Kids Club is held every Wednesday and Thursday evenings during January, where children can hold some marine animals. Nestled on the inside of Pambula Beach's southern headland, Pambula River mouth is beautifully sheltered from wind and swell coming from the south. Oddly for a beach with southerly protection, the river mouth works best with a northerly swell, as it refracts off the headland to form a ride-able wave. 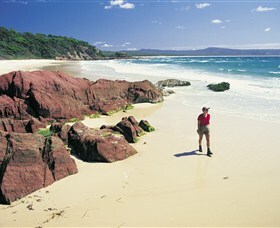 The sweeping sands of Pambula Beach are ideal for walking and beachcombing. Collect shells washed up with the tide and explore the fascinating rock pools. 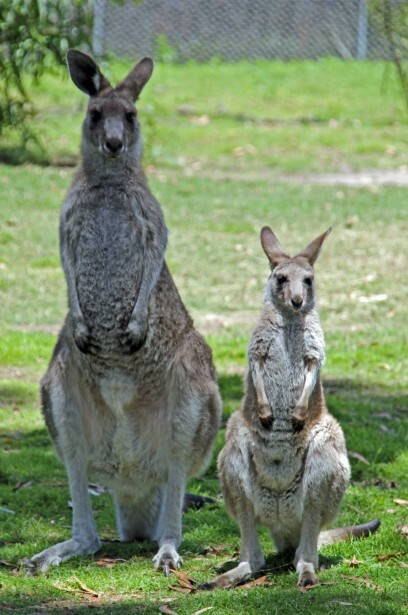 Lunch with the kangaroos or take a horse ride through the local wetlands and river flats. 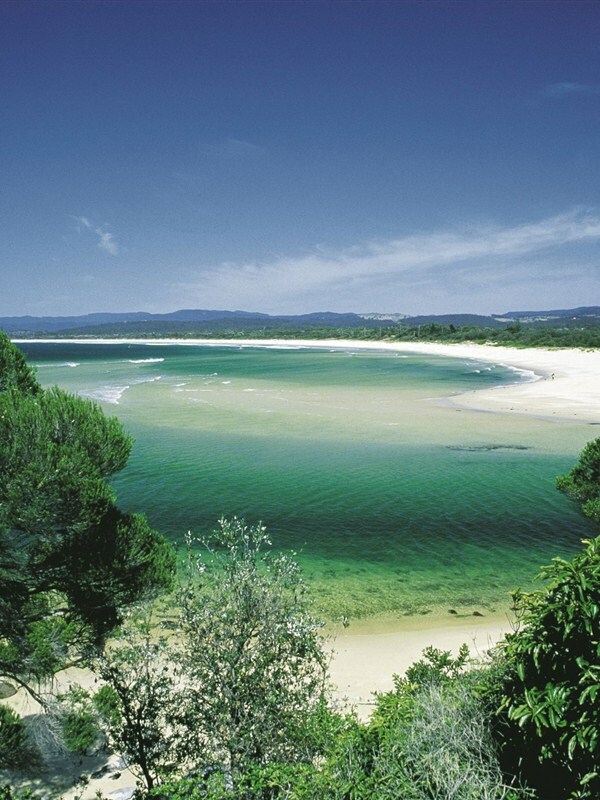 Ben Boyd National Park lies to the south of the town, across Pambula River. There are good surfing locations along the beach.